When you need answers for your garage door, click here and read short answers to standard questions. When opener sensors must be changed? Too much dirt and worn wires will make opener sensors unreliable and perhaps dysfunctional. They may lose contact with the garage door opener and won't offer you the expected protection. You should try adjusting them and some sensors have a red and green light showing whether they work. If they still don't work properly, you should definitely proceed with garage door sensors replacement. Many accidents happen due to malfunctioned sensors and you can avoid them. Are insulated garage doors significant? The experts of Garage Door Repair Emeryville would recommend insulated garage doors for garages attached to homes because the temperatures will affect the whole house. Thick door panels with high r-value insulation will offer you excellent temperatures indoors but they will also help you spend less for energy consumption. You must seriously consider them during garage door replacement and although they cost more they will help you save much more in the long run. Should I install safety cables on my own? Today, you can find instructions about how to install garage door parts but actually if you lack the experience, equipment and expertise, reading the instructions will not be enough and won't necessarily save you from getting injured. 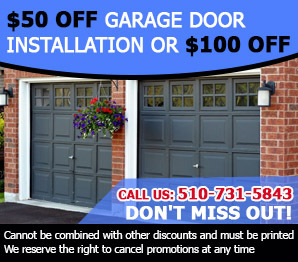 Remember that the experts of our garage door company in Emeryville are at your service for installations.